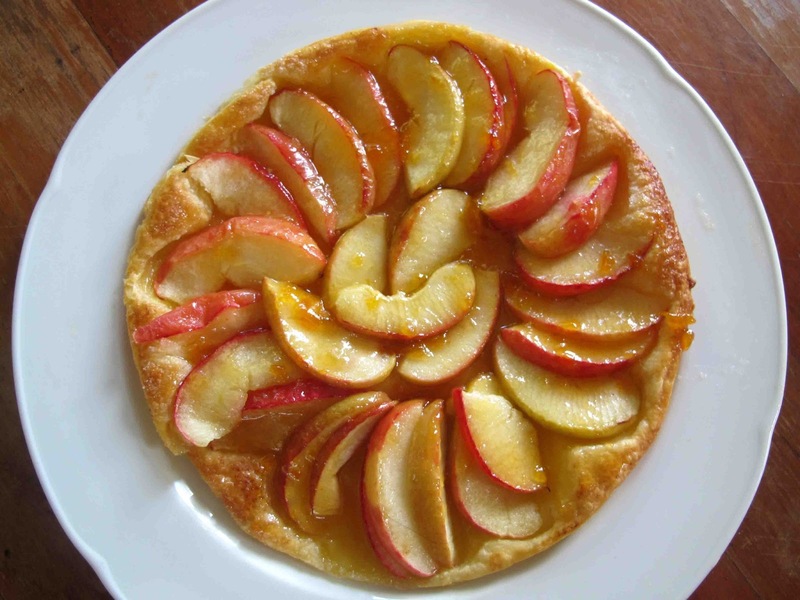 For an impromptu Bastille Day brunch serve this easy, rustic French Apple Tart alongside a platter of ham and cheese croissants. Take the pastry out of the freezer and let it defrost until it is slightly pliable. Using a 22 1/2 cm plate/bottom of a cake tin as a template cut a circle out of it. Place the circle of pastry on a baking paper lined oven tray. Turn up the edges all around to contain any juices as it bakes. Put in a bowl, add the lemon juice and toss them around. Then arrange them in an overlapping circle on top of the pastry. Take some butter out of the fridge (it must be cold )and grate two tablespoons. Dot the grated butter over the apples. Put the tart in the oven and bake at 200 degrees C for about 20-25 minutes until the pastry is puffed and golden and the apples are tender. Put 4 tablespoons of apricot jam/apricot conserves in the microwave to soften for a few seconds. Stir in 1-2 teaspoons of rum/ drambuie/ water to thin it a little. Use a silicone pastry brush to spread it evenly over the apple tart. Serve the tart as soon as it has cooled a little with yoghurt/whipped cream.